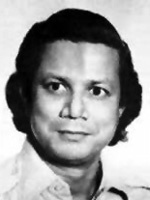 Born in 1940's East Pakistan prior to the independence of Bangladesh, Yunus' family was prosperous and he was able to attend preparatory school and college in his home country, earning a MA in economics. After an excursion into the printing business which he pawned off onto other members of his family, a Fulbright Scholarship and 98th percentile score on the Graduate Record Exam permitted Yunus to attend Vanderbilt University where he earned a doctorate in Economics. He taught in Colorado and now teaches in Bangladesh. Yunus' methods have been applied to Burma and in Kosovo, with success. He now is embarking upon an effort to "eliminate poverty entirely" in Bangladesh, and by extension via the U.N. to other places, by using these and similar techniques. In 2007, his Grameen Bank began offering loans to impoverished Americans.